Donating funds to charitable organizations is a good practice. For people with a comparable wealth of disposable income, donating a portion of that unassigned money to people in need is the definition of a good deed. Today, thanks to mobile technology, almost everything we do that involves money is easier to do, and that includes donating funds to charitable organizations or natural disaster relief efforts. “Text your donation to” is a phrase seen and heard frequently among anyone with a smartphone, or who watches television news stations regularly. Surprisingly, despite the ease of effort required to send funds to organizations like the Red Cross which were created to help people in dire need of support, few wealthy investors have taken advantage of the mobile technology to actually send donations via text. According to Spectrem surveys of wealthy investors, 92 percent donate at least $100 to charitable organizations on an annual basis, and 30 percent exceed $5,000 in contributions annually. Those percentages are not surprising; whether donations are done for tax considerations or out of the good of the heart, investors with sizable assets are likely to help organizations financially on a regular basis. 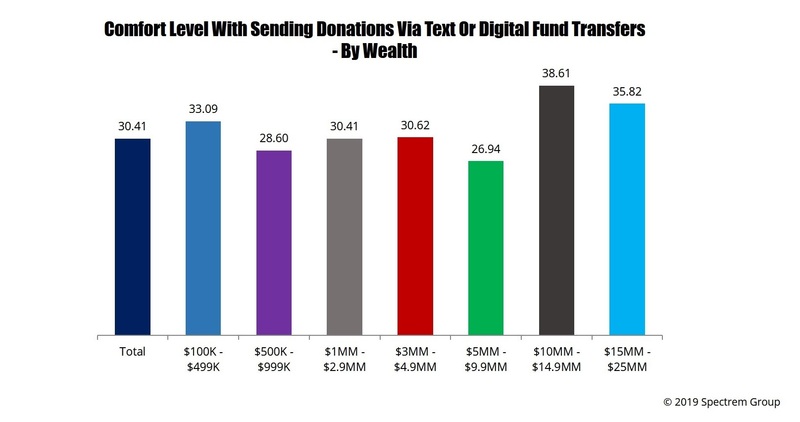 But, according to a new survey of wealthy investors, only 21 percent have ever texted funds to a charitable group. That is a surprisingly low number considering 74 percent are aware that technology allows for an easy transfer of funds via texting. There seems to be a lack of comfort for texting relief funds, which may be related to cyber-security issues which color all digital financial transactions these days. Asked to rate the comfort level of making digital transfers to charitable groups, investors on average rated it at 30.41 on a 100-point scale, which is low. Of the investors who have made digital fund transfers for charitable purposes, 60 percent have donated to relief efforts for areas and people affected by natural disaster, and 43 percent have made donations to organizations working toward social and humanitarian causes. Another way investors can donate to charitable causes is through crowdfunding sites such as GoFundMe. But a recent scandal indicated that people who create GoFundMe pages may not always be on the up-and-up. So it is not surprising that the comfort level for donating to crowdfunding pages is very low (19.11 on a 100-point scale), and only 17 percent of investors have contributed to such efforts.